Ask for price - Hours: 2,500 h - Used equipment ready for use. - Telescopic handler in 2008. Ask for price - Hours: 5,383 h - Reg. number: 9950 - Max. height: 13 mt - Max. load capacity: 30 t - General good condition used equipment, ready for use. - Telescopic handler in 2002. Ask for price - Hours: 2,135 h - Reg. number: 585888 - Max. height: 14 mt - Max. load capacity: 35 t - Used equipment ready for use. - Telescopic handler in 2010. Hours: 4,238 h - Handlers - Diesel forklift truck in 2000. Ask for price - Winch 16 ton for Manitou MT10160 - Winch in 2010. Genuine Manitou winch Capacity 5.000 kg Weight 420 kg - Winch in 1996. Ask for price - Hours: 5,000 h - Max. height: 9 mt - Max. load capacity: 40 t - MANITOU 940 Working height 9m Capacity: 40 q.li Year: 2007 Hours: 4000 ca With Forks - Farm telescopic handler in 2007. Front bucket Manitou CBA 1500 for Manitou telescopic handlers, year 2016, weight 460 kg, working width 2050 mm. - Benna anteriore in 2016. Front standard bucket CBR 1000 for Manitou telescopic handlers, year 2009, capacity 1000 lt, width 2450 mm, mass 390 kg. - Benna anteriore in 2009. Ask for price - Hours: 1,570 h - Max. height: 5 mt - Max. load capacity: 26 t - General very good condition used equipment, ready for use. - Rough terrain forklift in 2009. Ask for price - Max. load capacity: 22 t - General good condition used equipment, ready for use. 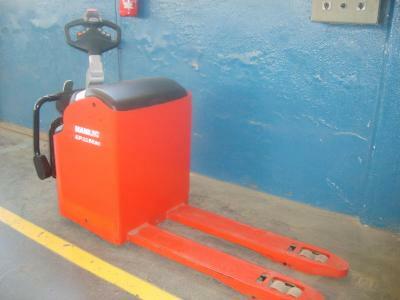 - Electric pallet truck in 2012. Ask for price - Max. height: 4 mt - Max. load capacity: 15 t - Mast type: Duplex - General good condition used equipment, ready for use. - Four wheel electric forklif truck in 2012. Used equipment ready for use. - Telescopic handler in 2007. Ask for price - Hours: 630 h - Reg. number: C00999806 - MANITOU MVT 625 - Telescopic handler in 2018. Ask for price - Hours: 3,350 h - Max. load capacity: 40 t - General very good condition used equipment, ready for use. - Telescopic arm forklift in 2011. Ask for price - Hours: 5,300 h - Max. height: 25 mt - Max. load capacity: 40 t - General very good condition used equipment, ready for use. - Rotating telescopic handler in 2008. Hours: 5,919 h - Reg. number: 6054 - Bucket - Forks Perkins engine 1004-4Y (78kW ) Lifting height 14.9 meters Max capacity 4000 kg - Rotating telescopic handler in 1996. Hours: 5,300 h - Reg. number: 120141 - Machien with Forks and bucket euro 24.000 Manbasket piloting ed extending Eruo 5.000 Winch 5 ton Euro 5.000 Jib with winch euro 3.000 Full docs - Rotating telescopic handler in 1996. Ask for price - Hours: 5,600 h - Max. height: 21 mt - Max. load capacity: 50 t - General very good condition used equipment, ready for use. - Rotating telescopic handler in 2010. Hours: 3,791 h - Reg. number: 4664 - Forks Man basket Winch Docs - Rotating telescopic handler in 2003. 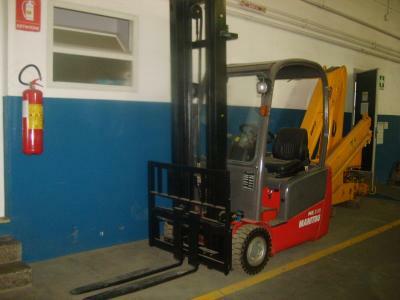 Hours: 5,087 h - Max height 3.300 mm Max capacity 2000kg - Diesel forklift truck in 2001. Ask for price - Hours: 4,700 h - Max. height: 4 mt - Max. load capacity: 30 t - General very good condition used equipment, ready for use. - Rough terrain forklift in 2010. Ask for price - Hours: 1,471 h - Reg. number: 220513 - Max. height: 17 mt - Max. load capacity: 40 t - Excellent condition used equipment, ready for use. - Telescopic handler in 2006. Hours: 1,625 h - Reg. number: 935229 - Max. height: 6 mt - Max. load capacity: 25 t - General good condition used equipment, ready for use. - Telescopic handler in 2014. Ask for price - Hours: 6,600 h - Used equipment ready for use. - Telescopic handler in 2010. Ask for price - Max. height: 8 mt - Max. load capacity: 35 t - General very good condition used equipment, ready for use. - Telescopic handler in 2014. Ask for price - Hours: 3,543 h - Reg. number: 4385 - Forks Bucket Man basket Rear tyres brand new - front tyres to be changed - Telescopic handler in 2012. Ask for price - Hours: 4,100 h - Max. height: 13 mt - Max. load capacity: 30 t - General good condition used equipment, ready for use. - Telescopic handler in 2000. Ask for price - Max. height: 13 mt - Max. load capacity: 30 t - Used equipment ready for use. - Telescopic handler in 2000. Ask for price - Hours: 2,500 h - Max. height: 13 mt - Max. load capacity: 32 t - Excellent condition used equipment, ready for use. - Telescopic handler in 2009. Hours: 4,476 h - Max. height: 13 mt - Max. load capacity: 40 t - Telescopic handler Manitou MVT 1340 L, year 2010, 4476 working hours, weight 11300 kg, engine Perkins 4 cyl. turbo 102 hp, max lifting capacity 4000 kg, max lifting height 13 mt, hydrostatic transmiss...continue. Ask for price - Hours: 2,800 h - Max. height: 7 mt - Max. load capacity: 29 t - General very good condition used equipment, ready for use. - Telescopic handler in 2008. Hours: 3,486 h - Reg. number: 15864 - Forks Bucket Hook - Telescopic handler in 2006. Hours: 5,000 h - Reg. number: 10019 - Forks New tyres Road docs Max height 6300 mm max capacity 2800 kg - Telescopic handler in 2001. Ask for price - Capacity 1200 kg - Winch in 2004. Ask for price - Man basket for Tunnel Capacity 1.000 kg. Empty weight : 730 kg. Center of gravity : 870 mm. working pressure : 260 bar CE mark - Access platform in 2016.